Ray Lewis joined Brian Dawkins, Randy Moss, Terrell Owens, Brian Urlacher, Jerry Kramer, Bobby Beathard, and Robert Brazile as the 2018 Pro Football Hall of Fame inductees. And during the enshrinement ceremony on Saturday night in Canton, we got a look at the new HOF members’ busts. Most of them were very well done, but the Ray Lewis bust looks a bit off. 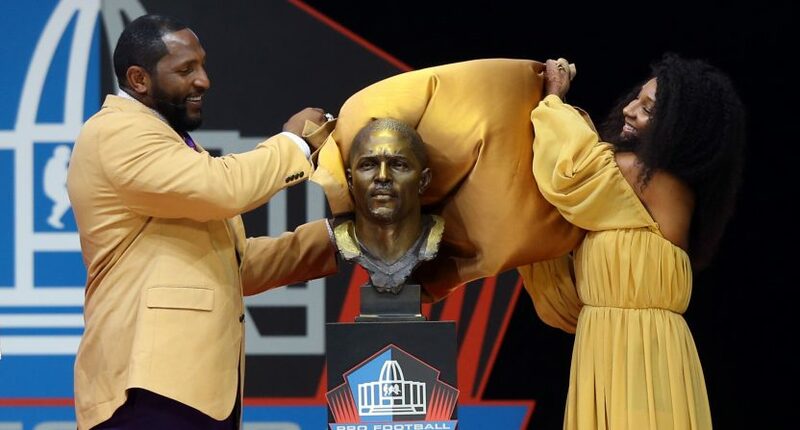 Naturally, Twitter had plenty of reaction to it, with people saying the bust looks closer to athletes like Warren Moon and Santonio Holmes than Lewis. They gave Ray Lewis a bust of Warren Moon. Ray Lewis’ bust kinda looks like T.I., not gonna lie. Now, it still beats the infamous Cristiano Ronaldo bust, and especially the Brandi Chastain plaque.